Former Manchester United boss Sir Alex Ferguson has defended current manager Louis van Gaal, saying success will return to the club. Van Gaal has failed to win a trophy in almost two years in charge, but Ferguson had to wait four years for his first silverware - sparking a run of 38 trophies in the next 22 years. "For 150 years of history it is worth having a couple of years on the quiet side of success because they will always come back and come back strong," Ferguson told Sky Sports. "You have to have some patience being a Manchester United fan and they have shown that over the years; in Matt Busby's time, in my time." 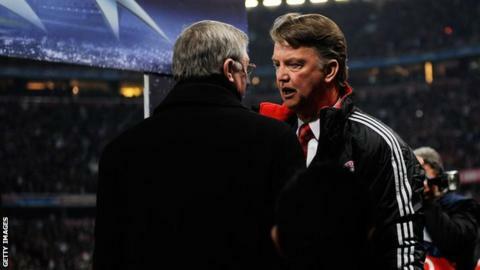 Van Gaal has won titles in Spain, Germany and the Netherlands, as well as the Champions League with Ajax in 1995. United have only won the Community Shield since Ferguson's retirement in 2013, with his replacement David Moyes not even lasting a season before Van Gaal's appointment. The Red Devils are sixth in the Premier League, although only one point behind fourth-placed Manchester City. They face West Ham in an FA Cup quarter-final replay on 13 April but lost in the Europa League to fierce rivals Liverpool. Ferguson added "it is dead easy to be critical" and cited injuries and the amount of summer signings as reasons for their disappointing season. Why did Neville fail at Valencia? Read more on Gary Neville: Why did he fail as Valencia manager?